If you haven't guessed it already, our family loves travelling. And while the phrase 'there is nothing quite like sleeping in your own bed' is true to a certain extent, nothing beats hearing the 'beep' of a magnetized key card, walking into a tidy room with a ready-made bed, dumping my stuff on the floor, pressing zero on the phone and having someone calling me Mr. Ang at the end of the line. Then at the end of the day when I get back to my room, my bed is all made again, clean towels are hung neatly on the rack, my toilet paper has an arty-farty fold, and brand new shampoo and bath gel get replenished. When I know I have a decent place to rest my head at the end of the day, everything else just falls nicely into place. And even better if the room itself is filled with awesomeness for the kids, complete with a laid-back charm. The thing about travelling with kids in tow is things can get pretty tiring at times. Sure, there are often the places of attractions that I usually would love to visit but truth be told, there are times when I wish all I could do while holidaying is to stay put in a resort and just chill, but yet still keep the monkies occupied at the same time. And in Holiday Inn Resort Mai Khao Beach in Phuket, it was just the perfect vacation spot for the wifey and me to catch our breaths. Situated right on Mai Khao Beach, Phuket's longest stretch of sand, my first impression of the resort was it was set in such a tranquil and family-friendly setting. Its location also means that it is only a 10-minute drive away from the airport - perfect for those who dread ultra-long car rides (that's me!). Check-in was a breeze - both metaphorically and literally, thanks to the sprawling and spacious estate that the resort sits on. But as huge as the resort is, the resort exudes a cosy boutique resort feel which is quite surprising given that Holiday Inn is an international hotel chain. I particularly loved how there are lush green gardens everywhere we turned but the best part that we spied while walking to our room was this. The ground floor pool access suites, which granted immediate access to a semi-private pool area. Definitely awesome stuff, so any wonder that the monkies were all pumped up after catching a glimpse of the rooms? We were hosted in a Family Suite and at first glance, our room was pretty decent. Sure, it was spacious and neat but nothing too out of the ordinary. Well, that was before I discovered that the room was connected to another door which opened up to a whole new world. Yes, how's this for a stupendous Kid's Room? It came fully furnished with two single beds (in child-friendly bedsheets, no less) and a play corner that includes a flat screen TV, a DVD player and a game console. For our room, it was the PS3 and the moment I saw that, I knew it would take some effort in peeling the monkies away from their room. And if that was not enough, the Kid's Room comes with a kids bathtub, vanity counter and separate toilet as well! So that everyone in the family will be able to live harmoniously during the pre-breakfast toilet rush. Just how big is the bathtub, you ask? Personally I love the added touch of providing a stool at the vanity counter, so that younger children will be able to reach the sink and taps independently. And yes, even the bath toiletries are tailored to the kids! Besides the Family Suite, Holiday Inn Resort Mai Khao Beach also offers the Kids Suite which essentially has the same concept with the TV, DVD player and game console, but housed within the same room with a bunk bed for the kids. And when I finally managed to pry the monkies away from their room, we discovered that the resort grounds had tons of activities waiting for us to discover. For starters, the area behind where the boys are levitating is the spot of Saturday movie nights. Comfy pool beds and deck chairs encircled a huge screen, and under the blanket of stars twinkling in the night sky, what's there not to love about such a movie experience? Unless of course, there is always the trampoline. Which predictably, induced loads of screams and laughter from the monkies. Besides jumping to one's content, there were plenty of outdoor activities to keep everyone occupied as well, from table tennis, dart-throwing to beach volleyball. So all those activities had got our tummies working overtime, and it was a good thing that the resort had recently set up Khun Pa's Restaurant, which offers a local style lunch in a Thai street food setting. Expect everything - from the stall, food to the table setting - to be modeled after a street food setting. Prices were pretty reasonable, food was palatable and most importantly, the monkies lapped it all up. 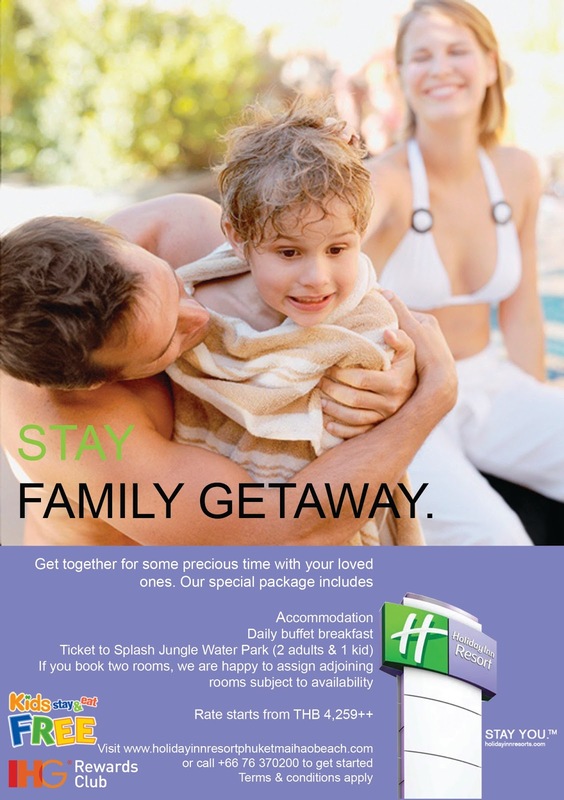 Speaking of food, did you that kids stay and eat FREE at Holiday Inn Resorts? More details can be viewed here but trust me, the savings can add up to quite a fair bit especially when one is travelling with younger children and find it a chore to dine outside the resort. We tried the Thai-rific Street Food Buffet Dinner at J's Cafe and Restaurant on one of the nights and quite frankly, it was a buffet after my heart. There is nothing quite like local street food and everything about the buffet was very well done. Best of all, it was in an air-conditioned setting so no complaints about that for sure! The wifey and I even had the time to participate in a special cooking class conducted by one of the chefs at J’s Restaurant. Three Thai dishes - Tom Yan Goong, Chicken Gree Curry and Grilled Skewered Chicken - were pre-selected for us, which were also to be our lunch for the day. No stress then, since nobody but us had to taste our cooking. Heh. After we got suited up in the appropriate chef gear, we got our cracking. We were fortunate that all of the ingredients were already prepared in neat stations for us, and all we had to do was to follow the chef's lead. Frankly, it's idiot-proof that I surmise that even the boys could do it. You would have to visit our Holiday Inn Resort Mai Khao Beach photo album on Facebook to view our end products but suffice to say, both the wifey and I received certificates for our efforts. Woot! In the monkies' eyes however, the fun meter which they uses to rate each hotel or resort they stayed in was never about the food. Rather, it has always something to do with this. And the resort's pools did not disappoint. There was a huge toddler pool section, and plenty of swimming room complete with tanning deck chairs for the adults as well. A poolside bar was always welcome, just so that the monkies can splash away while I enjoy an ice cold beer in peace. Inflatable balls were also readily available for free rental, so that took up most of our time in the pool - trying to be the super goalie who kept out the most number of shots in front of the goal post. Ale though, preferred to do some chilling of her own. Personally though, I prefer to do my chilling on Mai Khao Beach itself because it is just beautiful. That, and the fact that it hardly had a person on the beach! Patong Beach it most certainly is not, and I mean that in a good way. I love how non-crowded the entire stretch of beach was, and I think the monkies agreed with me. And if I thought the monkies would be dead beat after all the time in the pool and by the beach, I was proven wrong the moment they caught sight of this. A fair enough activity to expend more of the kids' energy, but the real biggie came in the form of a standalone building right beside the outdoor playground. Yup, I think the monkies discovered heaven when they first stepped into the Kid's Club. From the indoor ball pit (with its own slide! ), play toys, art & craft tables, to the Wii, XBox and PS3 gaming consoles, I have no doubt that every single child will be duly kept entertained in the colourful premises. At least mine were. The cosy reading nooks were a personal fave of mine! If your kids are aged between 4 and 12, they can be left to the Kid's Club team staff's care while you sneak off for some well-needed couple time. Don't worry about the kids getting bored as there are tons of activities like face painting, sand art and balloon making planned for kids every single day. Just take a look at its daily schedule HERE. Yes, adults are not left out as well with the wifey even waking up earlier than usual just so that she can join in the Yoga classes. We even had the chance to dabble in some Batik Painting, which is usually held right by the beach. But since it was drizzling during our time slot, we did ours in the Kid's Club. Compared to Indonesian Batik, Thai Batik uses a different wax resistant dying technique and showcases the vivid colors that reflect Phuket's colorful surroundings. After we were done, the batik needed to dry overnight, before picking them up the next day. Oh, and if you have kids older than 12 years old, there is the Teen Zone where they will be able to keep themselves entertained with board games, a pool table and movies. Besides the kids-friendly recreational activities that the monkies got to experience, the other thing that had them looking forward to every morning was the resort's buffet breakfast at J's Cafe and Restaurant. The breakfast looks pretty standard, you say? Well, I agree but what won me over was the dedicated row of buffet spread just for the little ones - and at the appropriate height, with kids cutlery! It even came with the kids' own private dining area. Exclusivity at such a young age. As for the adults, we had to make do with dining in a sunken booth alongside a meandering pool. Not that I am complaining! Our final meal of our stay at Holiday Inn Resort Mai Khao Beach before check-out came in the form of an Italian lunch at Pesto Restaurant. Pesto serves up pastas, crisp wood-fired pizzas and grilled mains of seafood and succulent meats in a casual beachfront setting. Kids (and adults) will take particular joy in having the opportunity to create their own pasta or pizza and decide what ingredients go into their meal. Which the monkies did not need any invitation to do so. You chose it, you eat it. That's the mantra I impose on the monkies, something which they had no trouble adhering to since the pasta and pizza they created were absolutely delish. Ok, so they only chose the ingredients and the chef had a huge part to play in conjuring up the tasty dishes but what mattered was they walloped everything. An incredible thing happened during our 2-night stay at Holiday Inn Resort Mai Khao Beach. We did not step outside the resort AT ALL. Granted that the resort is situated a rather secluded location and there is not really very much to do around the hotel except for a local eatery right next door on the beach, and a mini-mart on left of the resort. But the activities, especially the kids-centric ones, were more than enough to keep us inside the resort and the monkies did not even complain of boredom. We were out in the pool and beach during the day, and the monkies played themselves silly at Kid's Club come evening time, and then it was back to even more gaming fun when we headed back to our room AFTER the Kid's Club has shut its doors. So that pretty much summed up our fun and even then, the monkies lamented there was not enough time to do everything! If you are looking for a holiday place to relax and avoid the crowds (especially the beach! ), then I cannot recommend Holiday Inn Resort Mai Khao Beach enough. Everything exceeded our expectations, with the Family Suite being the most obvious of them all. In fact, all of us will head back in a flash... as the monkies will tell you. Finishing all too soon, with every family member reluctant to check out and wanting to return again. That itself, is the litmus test of an awesome holiday resort no? P.S. I cannot possibly include every photo of our stay in this blog post, so do head over to our photo album on Facebook for more photos. Beautiful pics and very nice post! Thank you for this review!! We just booked it and I am soooooooo stoked about our stay at this hotel with our two monkies!!! !